Can you remember a world without the Internet? Without Sir Tim Berners-Lee, we may never have been able to communicate with friends on the other side of the world at the touch of a button, or find out about anything we need to know by typing into a search engine. Sir Tim was born in London in 1955, where he grew up, and then went on to study physics at Oxford University. After leaving university, Sir Tim became a software engineer, and this is how he found himself working at CERN – the European Particle Physics Laboratory in Geneva, in 1980. It was while he was there that he first began to talk about his ideas for a global system that would allow researchers from anywhere in the world to share their information. He started off by building a prototype called ‘Enquire’. In 1984, he returned to CERN as a software engineer and in 1989 his ideas began to take shape. He was working with groups of scientists from all over the world who would meet in Geneva to carry out their experiments, and then return to their home countries, which caused problems with communicating data and results. Tim wanted a way of connecting everyone’s computers together so that they could exchange information. It took Sir Tim a year to come up with the three pieces of technology that changed the world – HTML, URL, and HTTP. Once he’d come up with these in 1990, he went on to write the first ever browser, the World Wide Web, and the first server. The world’s first website, http://info.cern.ch, was launched on 6 August 1991, and it explained the World Wide Web concept as well as giving people an introduction to publishing their own websites. The original was hosted on Sir Tim’s own computer and is no longer available, but there’s a recreation of the first ever published website at: http://info.cern.ch/hypertext/WWW/TheProject.html. Slowly, people began to join the new community, and by 1993, CERN had announced its intention to let everyone use the new World Wide Web technology royalty-free, and the Internet as we know it was born. In 2004 Sir Tim’s contributions were formally recognised and he was knighted; then in 2007 he was awarded the Order of Merit by the Queen. Sir Tim has always been determined to open the potential of the Internet up to as many people as possible, and so in 2009 he established the World Wide Web Foundation, with the intention of working with the UK Government on ways of overcoming obstacles to his vision of an open web “available, usable, and valuable for everyone”. 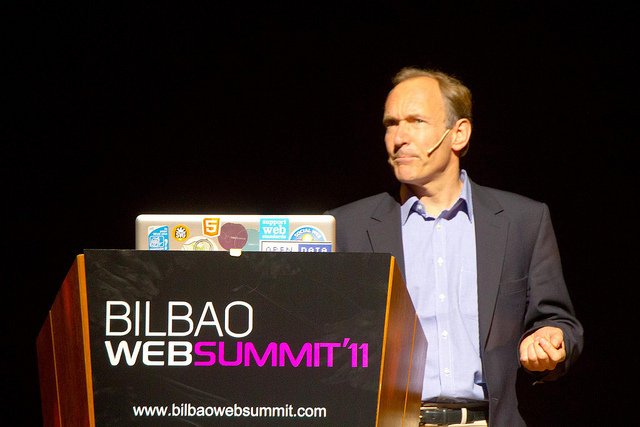 Sir Tim Berners-Lee currently works with the Computer Science and Artificial Intelligence Laboratory at the Massachusetts Institute of Technology, where he is also a director of the World Wide Web Consortium (W3C). He teaches at the university as a 3Com Founders Professor of Engineering and in a joint appointment in the Department of Electrical Engineering and Computer Science at CSAIL. He is also a professor in the Electronics and Computer Science Department at the University of Southampton, and one of the founding directors of the Web Science Trust, a charitable body that supports the global development of Web Science, also hosted by the University of Southampton. Sir Tim has received numerous awards, including the Queen Elizabeth Prize for Engineering, which was awarded for the first time on 25 June 2013. Sir Tim was one of the five engineers who received the award from the Queen. About Author: Written by James Seehan, a blogger with an interest in computer science.